It’s been a long time since Bev and I have slept in a car. We have slept on the roof rack basket of our Landcruiser but never inside. During our 1972 journey we slept in the Beetle on many occasions. Sleeping in the Beetle involved either lying the seats back as we did last night or removing the seats completely and sleeping in the floor pan. I can’t remember any uncomfortable nights but I daresay there were. Our aim today was to get within a short drive of Bern where we are going to stay for a day or two prior to taking the train to the Cinque Terre in the Italian Riviera. It was still dark when we left the carpark and even though it was early there was considerable traffic. I would never be able come to terms with going to and from work in traffic, especially in the dark when the temperatures are in the minus zone. 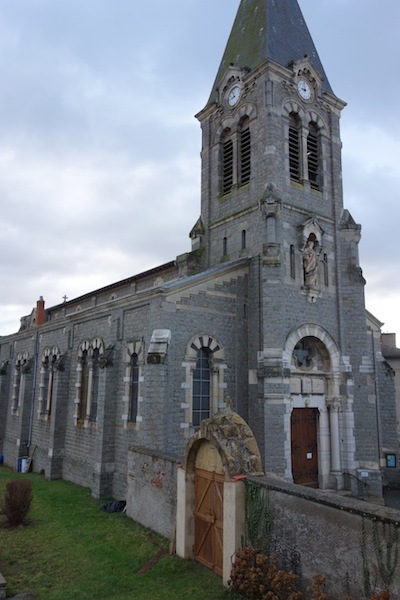 Just on daylight we drove into the village of Chirassimont and set ourselves up in front of the church, boiled a couple of eggs and made a brew. 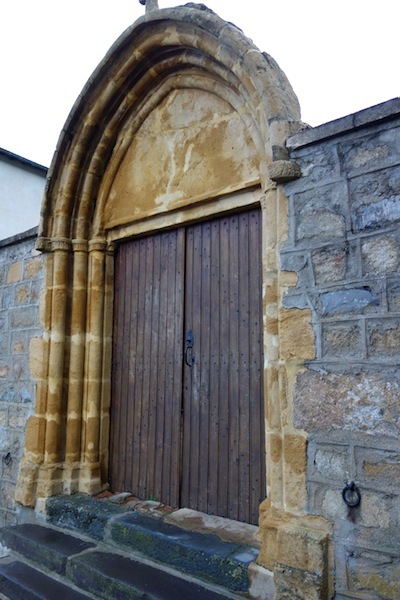 Portal in the church wall. Adjacent to the church was a communal vegetable garden. I enquired about the history of the church at the local council office and because of language difficulties the receptionist didn’t enlighten me but took us up a couple of floors and let us out onto a balcony from where we could see the reverse side of the portal and a view across the attractive countryside. The vegie patch secure within the church walls. Impressive entrance to a local town. I expect the profiles were cut using a plasma cutter. 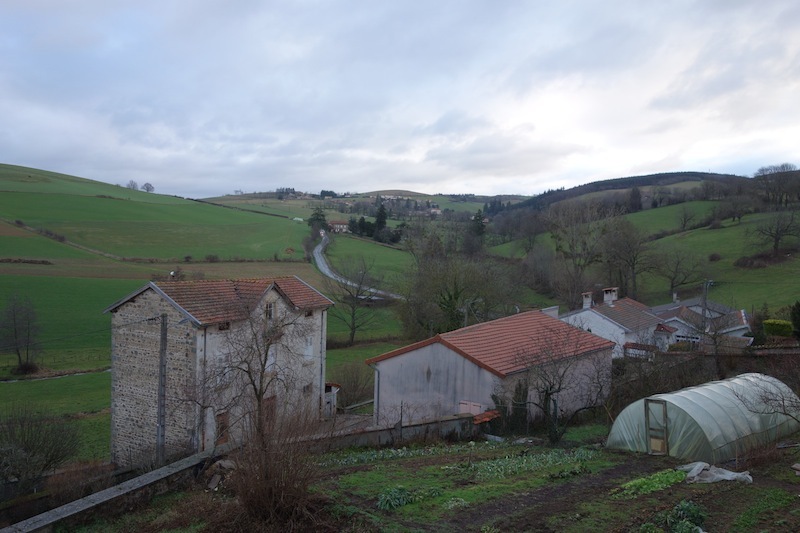 Around lunchtime we arrived at the town of Chatillon-sur-Chalaronne and what a pleasurable surprise! It is hard to describe the excitement and awe-struck wonder at seeing these visually striking buildings. The town’s main feature was the half-timbered houses. 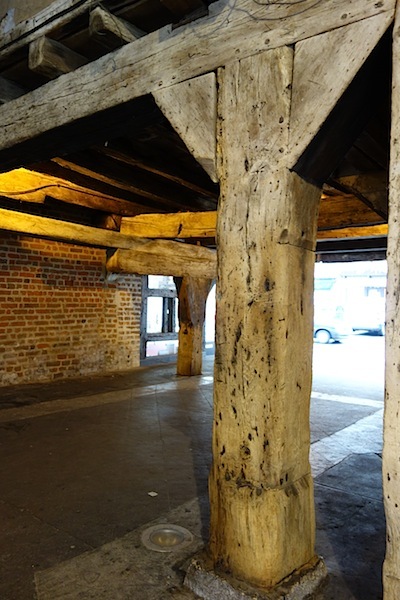 A half-timbered building derives its name from the fact that the wood framing (the structural strength of the building) is first erected then the spaces between the timbers are filled with plaster, brick, stone and/or cob. Cob is a mixture of clay, sand, straw and water. 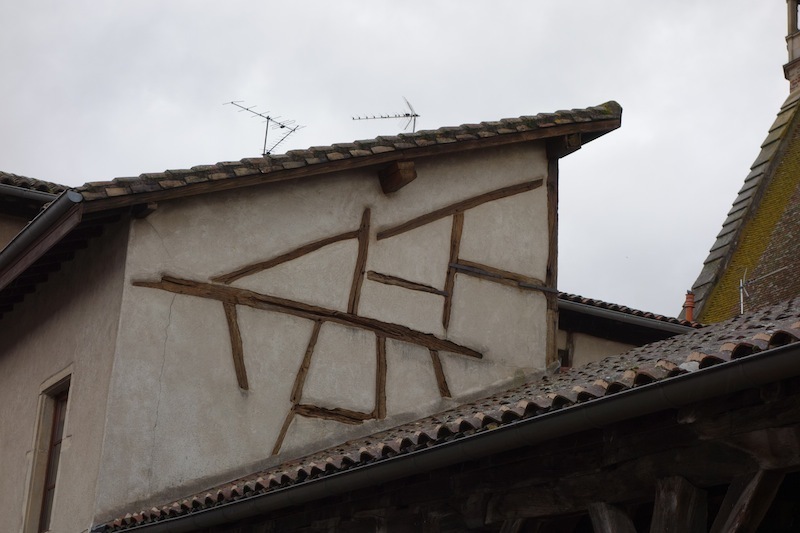 A fine example of half timbering. 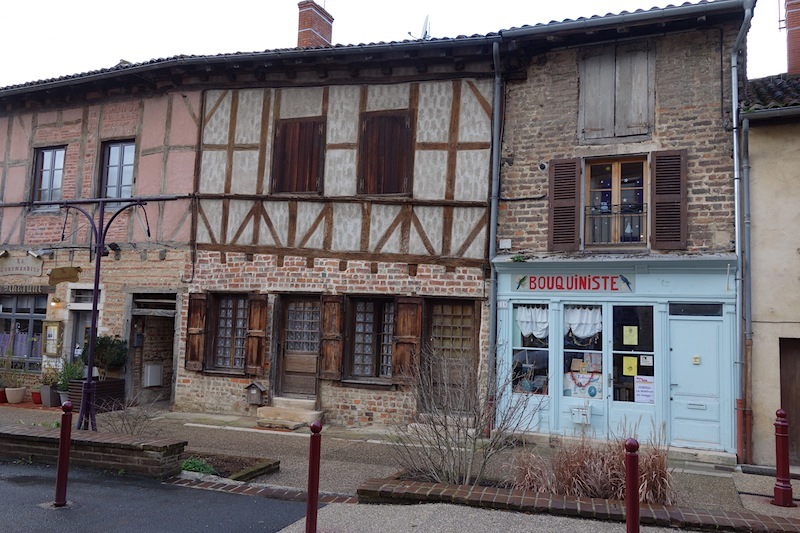 Elaborately half-timbered houses of the 13th through to the 18th centuries still remain in a few regions in France and we were lucky enough to stumble upon one region today. 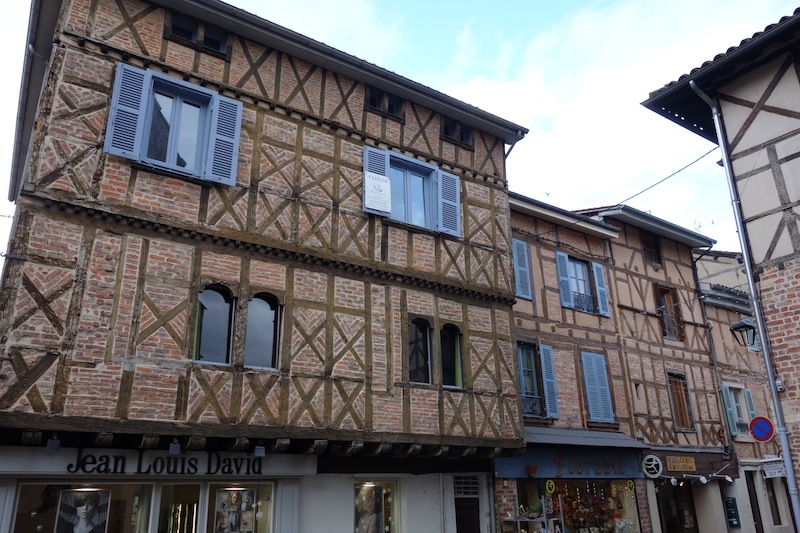 Timber framing in French is known as colombage. The structure usually has a brick or stone foundation at ground level onto which timbers are attached. Once the gaps between the timbers were filled the wall was then covered with lime for protection. 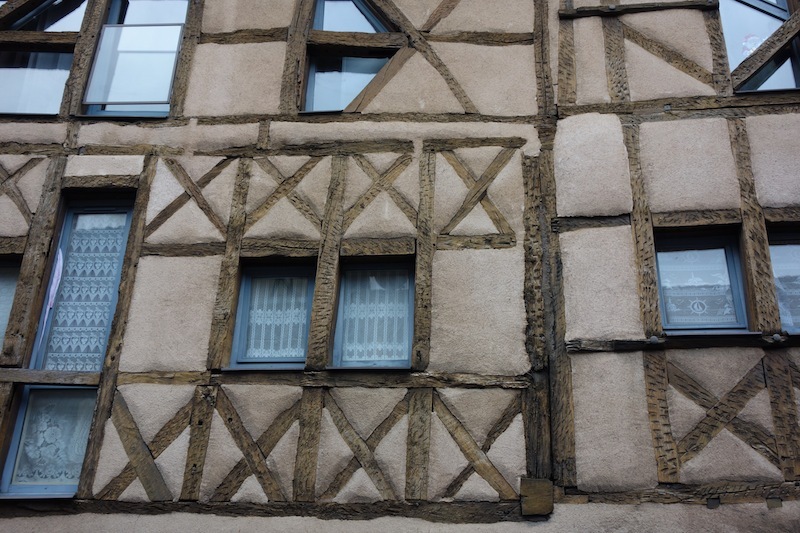 There was a period when owners of half-timbered houses stuccoed the outside of their houses covering the timbers but this proved fatal as moisture was trapped under the stucco and the result was rotted timbers. In latter years in England the timbers were painted with black bitumen paint and the infill white resulting in the name ‘Magpie houses’. 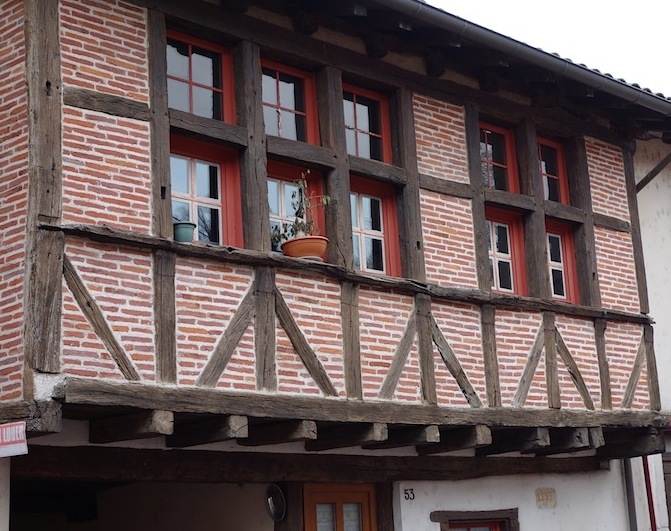 During the 1800s, it became fashionable to imitate Medieval building techniques and timbers were applied to exterior wall surfaces as decoration and, even today, imitation half-timbered houses quite often appear in housing estates. Bev loved the buildings and the streetscapes, consequently she took lots of photos! Here are some. 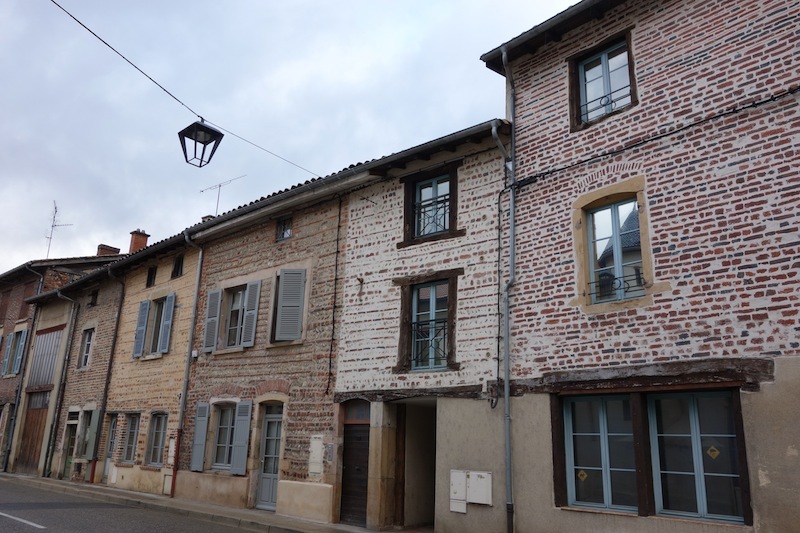 Another streetscape of quaint buildings in Chatillon-sur-Chalaronne. Random bond walled houses. Fortunately these brick buildings have not had timber decoration applied. In the brick-laying world there are dozens of brick bond patterns but in all the references there is no description relative to the pattern in the houses above. So the best I can do is call it a random bond. 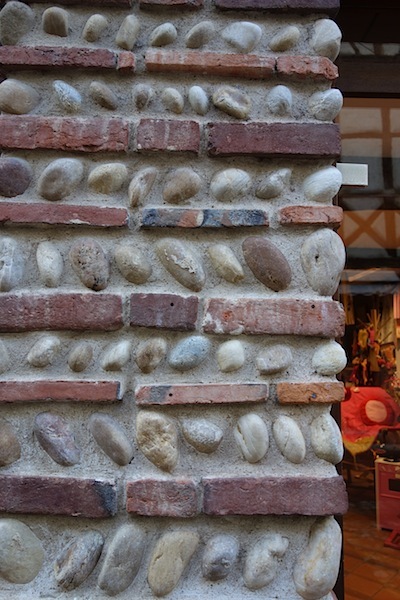 Impressive stone and brick conglomerate wall. Is this not the most remarkable window you have ever seen? Amazing! 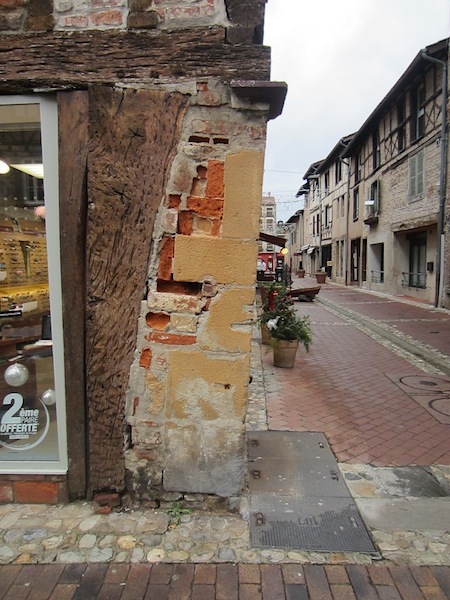 I would happily go to all the effort of returning to Chatillon-sur-Chalaronne to find out the history of this corner. 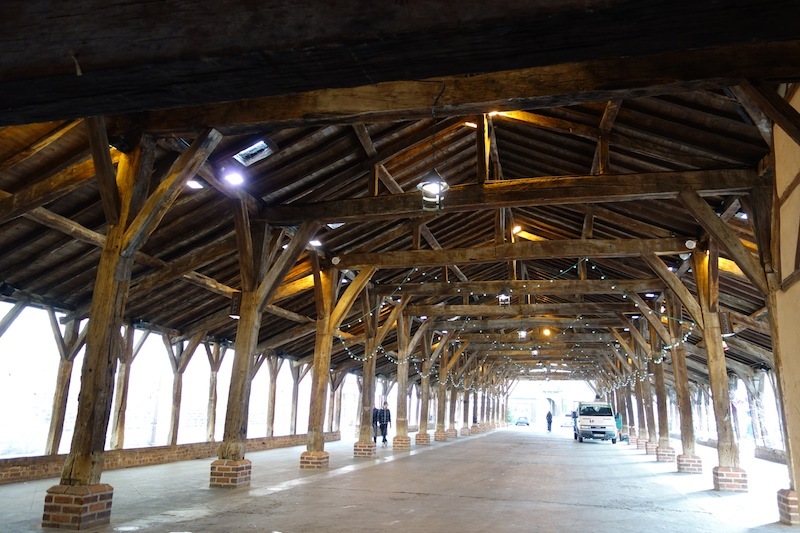 In the town centre of Châtillon-sur-Chalaronne there is a traditional covered market (Les Halles) whose origins date back to 1440 and where today every Saturday morning there is a fresh produce market. To work out how this window evolved defies comprehension. It has to be the most fascinating piece of architectural artwork I have ever seen. 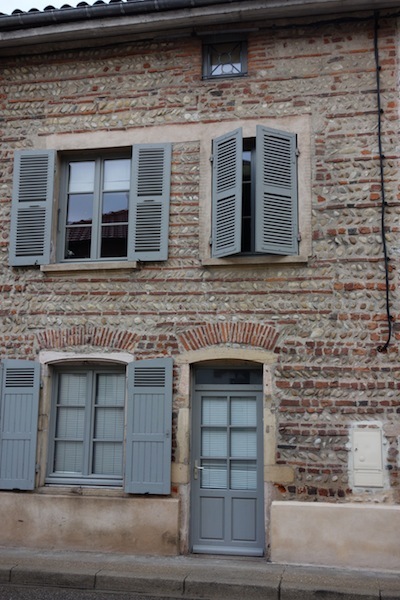 Look at the leaning corner, the odd tapered timber forming the window jamb. 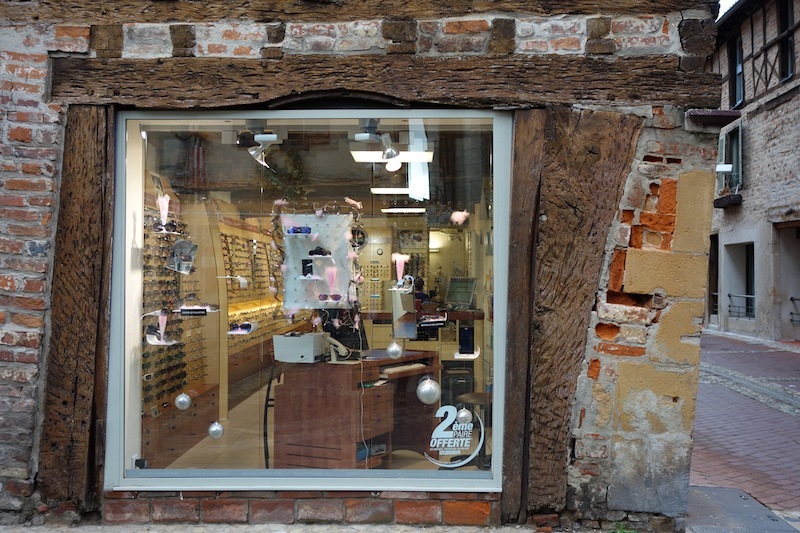 In retrospect I should have gone into the shop (optometrist) and asked about its history. Snickleway entrance into the covered market. The covered market area. The building was partially destroyed by fire in 1670 but rebuilt soon after. 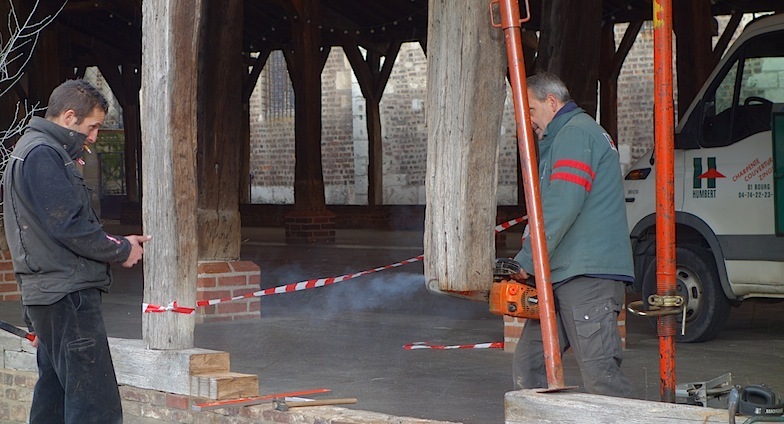 Replacing oak posts after 573 years (assuming it is a 1440 original). Europe has nearly thirty different species of oak and not being able to communicate with the builders I don’t know which of the thirty species this one is. Oak invaded the continent around 10 000 years ago when the glaciers of the last ice age withdrew northwards. Scarf joint detail. 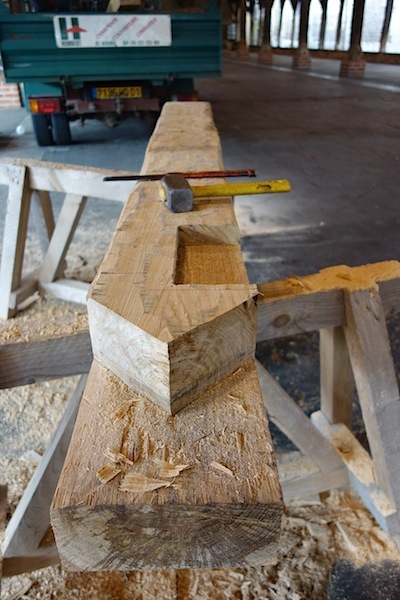 A scarf joint is used when joining timbers end to end. For me playing with wood is one of life’s greatest pleasures. I’m sure as soon as I get home from this odyssey it will be into the workshop to make something. 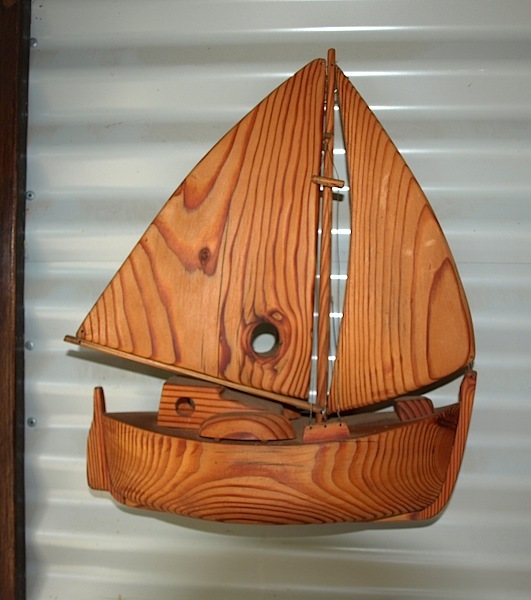 The last time we were in Europe I came home and made a model boat. The local gastronomic specialities include fish and frogs but we opted for a kebab for lunch today. The owner was from Antakya in Turkey near the Syrian border and when he knew we had been there he was surprised and overjoyed. 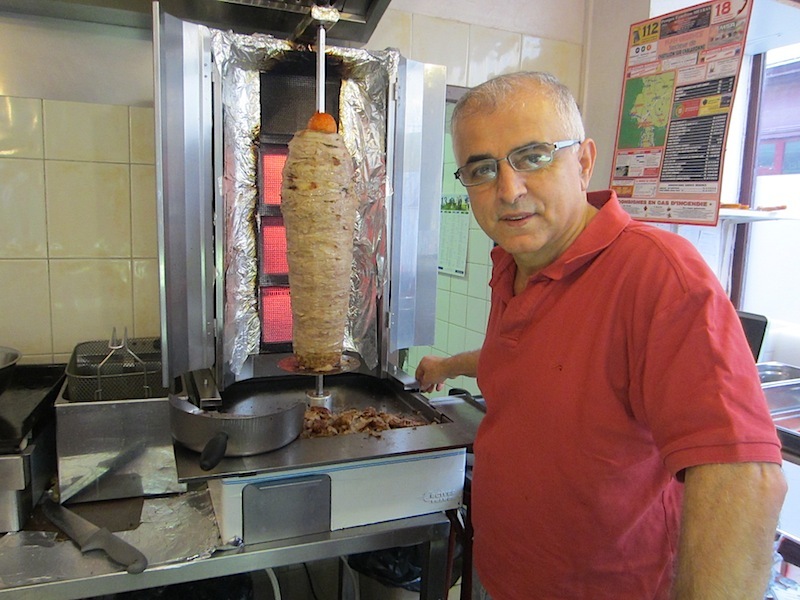 We can never go past a kebab. Gristmill stone step for short customers in the kebab shop. The design on the glass window is an arabesque. It was not easy to leave Chatillon-sur-Chalaronne as it oozes all things historical and again it is one of those places where we could easily hold up for at least a week but we have to push on as we have to be back in Bern by tomorrow as we are going with Swiss friends to the Italian Rivera for the Christmas New Year period. 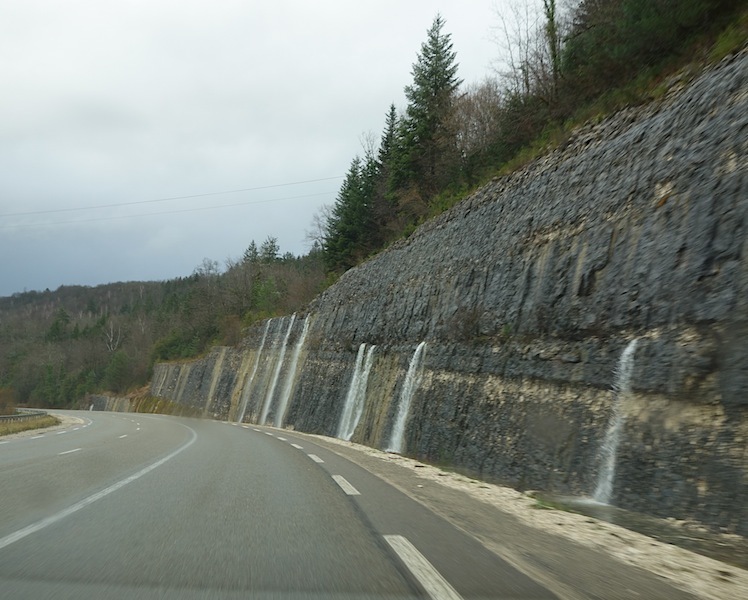 Not wanting to drive major roads we decided on a route which turned out to be an alpine one over the Jura mountains (Monts-Jura). It turned out to be quite an adventure as we ran into a severe snowstorm. 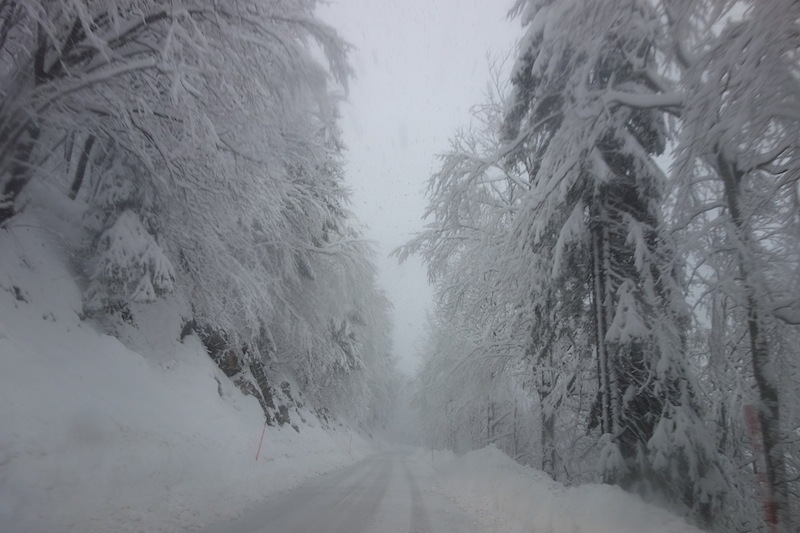 The drive over the mountain was a repeat of snowy 1972 adventures only this time we had no snow chains. This is a remarkable example of how underground water behaves. Rainwater has percolated through porous strata and when it encounters impervious rock it flows horizontally. 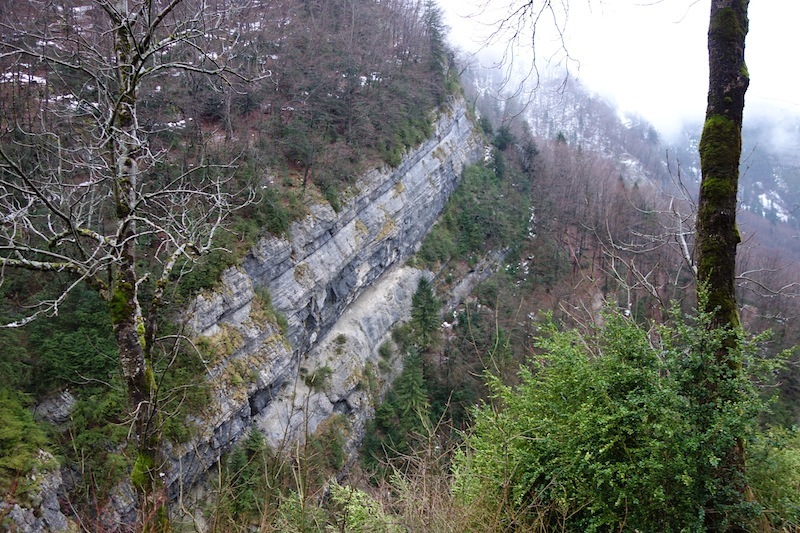 Gorges de Flumen on the road to Monts-Jura. 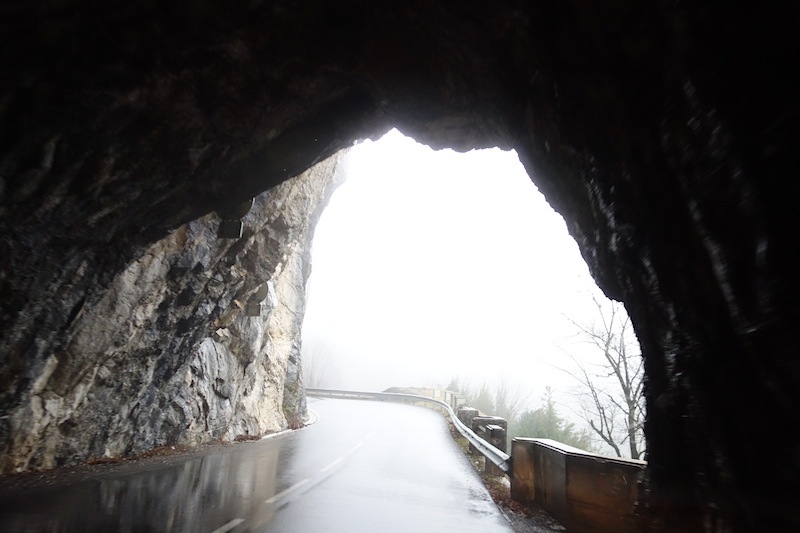 Tunnel on the road along the Gorges de Flumen. 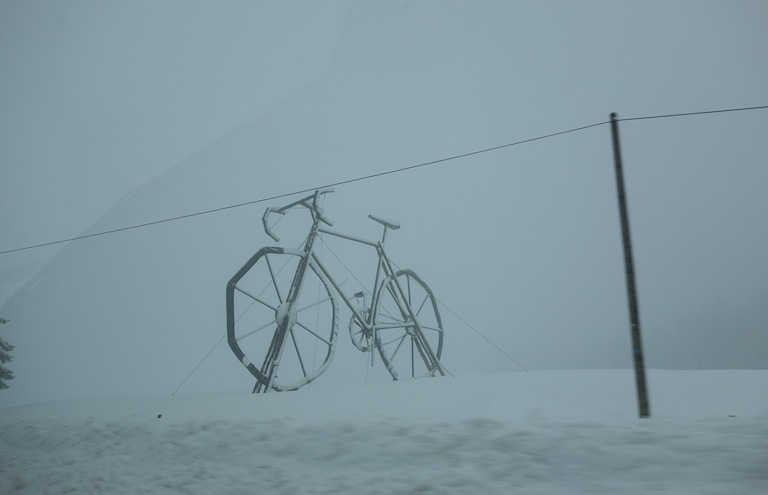 Mysterious giant bike in the snowstorm. 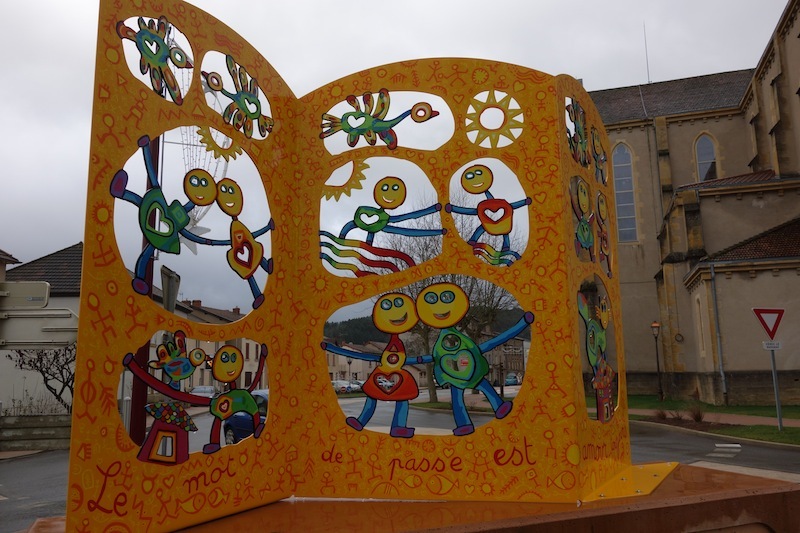 Many towns have a giant sculpture as a feature of the town and the alpine village we passed through had this giant bike. Note the size of the bike relative to the height of the power pole. 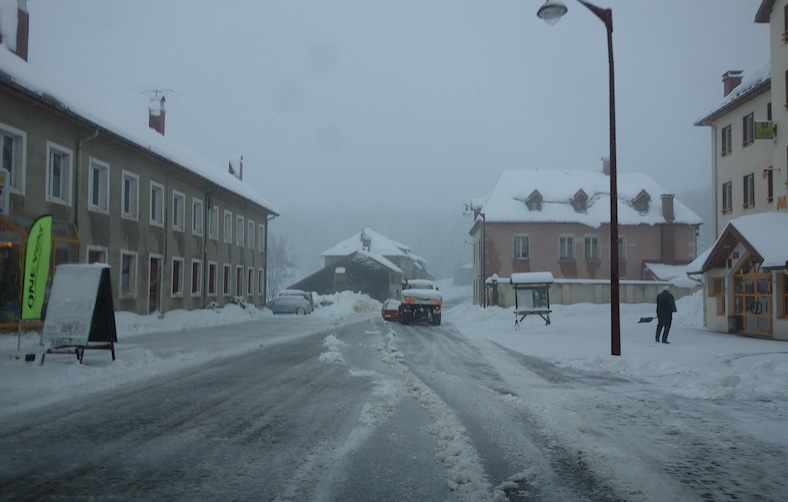 Eventually we came to Lajoux where Bev asked the snow shoveller (above) about conditions ahead. He indicated the road would be similar to what we had come through. We pressed on towards Gex. Driving in these conditions without snow chains was extremely slow as in places the surface of the road was frozen and it would have been very easy to slide off the road into the forest. The Fiat hire car with constant 4WD handled the conditions well. Signs telling us were on the right road. 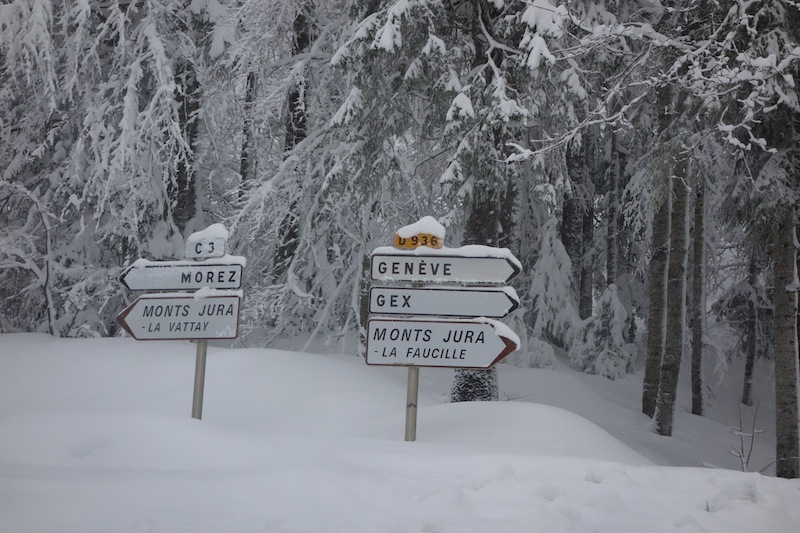 The highest point on the Jura mountains is near here and prior to coming across the signs we had two worries – were we on the right road and was the snow going to get so deep that the road would become impassable? 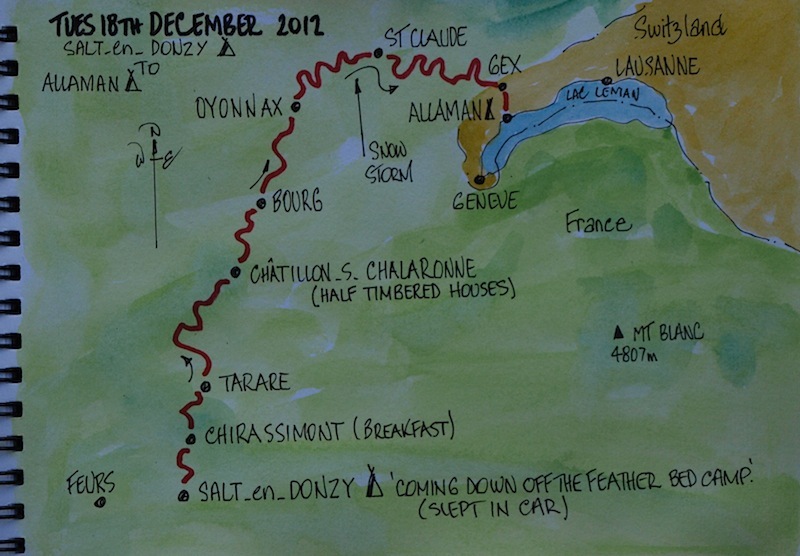 However our worries were alleviated, as down the mountain a little way we met cars coming up a sign the road was open. Tonight we are ensconced in a motel on the foreshores of Lake Genève. Tomorrow we are going to hit the road early in an attempt to avoid peak hour traffic. into Bern.